Description: The Binkerton twins, Josh and Emma, and their little sister, Libby, unwittingly stumble into the Good Times Travel Agency and are carried off on a trip they'll never forget. First, the kids are stowaways on a Viking longship. Then, the Berserker, the most feared of Norse warriors, drags Josh along on a Viking raid. And Emma makes a plunder blunder that turns the siblings into slaves! Will the Binkertons' latest saga come to an untimely end? 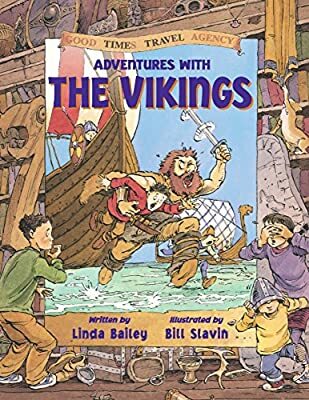 Adventures with the Vikings mixes fact and fiction for fast, funny and fascinating romps through the past. Kids will adore the contemporary comic-book look, while parents, teachers and librarians will love the well-researched story lines and solid factual information.